How can you train your voice to sing? Singing is all about manipulating instruments. And in my list of instruments, the voice box has a top position. How best you sing mostly determined by how best you use your voice and the limits you are ready to push to become a better singer. It is an undisputed fact that some singers are better than others. Your voice is the key to singing, and it can be trained to reach its peak. There are numerous vocal and singing techniques, which have developed over the past hundreds of years. With each passing day, people are learning new ways to control their voice to produce different sounds. How Can You Teach Yourself To Sing? You need to train your voice to know the range and capabilities of your singing voice and prevent developing bad singing habits or worst, risk damage to your vocal cords. 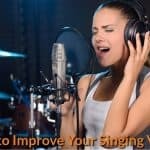 There are several easy vocal exercises both for the beginners and professional singers that will help you master your voice. During singing, your vocal cords vibrate many times in a single second. Warming up your vocal cords helps prevent straining and injuring them. To warm up your voice, start with basic breathing exercises. Inhale and exhale with your mouth, until your lungs are empty. After that, you can start singing long easy tones in a comfortable range. Proper breathing allows you to hold notes together longer and also reduce the likelihood of damaging your voice. Select a tone that is easy for you and in a single breath, begin singing it in a soft and low volume. Build up your volume gradually, until you reach your maximum comfortable volume then revert to your softer volume. The most crucial tip on teaching yourself to sing professionally is learning how to control your breathing. Holding back your breath is one of the most common mistakes that many people do while singing. You have to allow air to flow freely through the body. If you feel that you have the insufficient supply of air, all you need to do is learn how to breathe differently. The secret is breathing from the diaphragm instead of the chest. Doing a simple exercise through using diaphragmatic breathing is one method of learning how to sing better. All you have to do is to place one hand on the chest and the other on the diaphragm and then you take breaths steadily. The hand on the chest should not move while the hand on the diaphragm should move inwards and outwards slowly as the diaphragm moves. Some of the basic things a singer needs to know are how to project his voice to the audience as a pleasing and attractive sound. And this can happen only if you do vocal exercises, breathing exercise, learn breath control with deep breathing and breathing from the diaphragm, develop the strength of your vocal chords by doing voice exercises, etc. Mastery of pitch is one of the essential aspects of singing well. You can improve your pitch by practicing arpeggios and scales. Use a keyboard or piano to identify notes that are within your range and practice each scale in every single key by moving up and down using your vowel sounds. The keyboard or piano enables you to stay in tune. Always keep in mind that pitch is key to successful singing. Before you start practicing scales, ensure that you warm up adequately. Practicing scales can push your voice to its limits regarding pitch and can result in an injury of your vocal cords. In practicing your scales in singing, you should progressively move to higher notes by semitone every other week. As the saying goes, practice makes perfect, keep practicing your scales frequently and you will eventually find yourself capable of singing in registers that were previously impossible. Here, you need to put the techniques you are learning into practice. You need to sing the music just on a single vowel or on some simple sounds such as ‘rrr’ or ‘sss.’ When switching from one pitch to the next, you need to make the process effortless so that your voice just slides from a pitch to another fluidly. 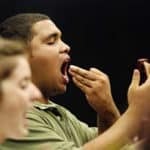 Although scales and exercises help in building up your voice and develop proper singing techniques, practicing songs makes your voice entertaining. When choosing a song to practice ensure that you pick songs that are not outside your range or are too hard for you at your current level. Try to adjust the key and sing with it first if the song you tend to sing is very high in keys or it’s out of your tessitura (comfortable vocal range). Another aspect of good singing is a good posture that will help in the free flow of air through your body allowing you to sing freely and powerfully. Of course, if you are taking private training, your coach will surely teach all these methods to train your voice. But, for your info, these tips and exercises are also available in the singing lesson exercises offered in computer compatible CD courses. The other step to take in your pursuit of learning how to sing is to understand how to emote. Emoting refers to the display of emotions and the capability of evoking emotions from the audience in addition to making them active by the performance. Emoting is part of the performance, and if you do not know how to emote, there is something you are missing. So next time you want to know how to train your voice to make a good singer, just follow the above steps, and you will be on your way towards perfection. Many people have at one time asked themselves the question how can I teach myself to sing? This is due to the inability of many people to have access to funds to pay for their singing lessons, or they are unable to let other people watch them when they are practicing their singing. There are also some easy to follow tips that will teach you how to improve your singing. Through adhering to these tips, you will be able to captivate your audience with your tone and powerful vocals in a matter of no time. Most of the people think that singing is an innate talent and present only in a lucky few. This is a totally wrong conception. In fact, if someone has some amount of inborn talent for singing it can only be considered a bonus. The rest of the singing part is hard work, commitment, passion and the will to take proper singing lesson exercises. As regards talent, it is a very gray area not worth discussing especially when people misuse it or not use it. This is amply proved by television shows like American Idol where supposedly talented singers come up and do an awful job and are totally taken aback when the judges expel them from the show. You will also find a lot of timid and shy people who can sing fairly well but are doubtful about their own talent for singing. Both the categories of people need to know that they have to work hard to develop their talent and use it to its full potential. There are different ways of developing your voice, and improving your singing quality. Singing lesson exercises can be had with a one to one training with a private coach if finances are not a problem for you. Remember that these classes cost a bomb and once you start you may need to finish the course to see some effect. However, one to one teaching is definitely worth it because the teacher takes exclusive care to see that you develop your singing skills and tailors the coaching to your specific needs. On the other hand to identify a good vocal trainer is not all that easy and they are very much in demand. Another option would be to select a singing course that has been converted to CD lessons by good vocal tutors. 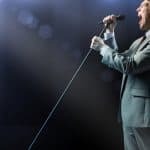 There are quite a few options by famous professional singers who have developed self-learning singing courses that include, booklets, CD s and videos with which you can train yourself at your won pace. This is by far a more economical option when compared to a private tutor, and it also gives you the freedom of time. So if you are committed and patient, go for it. The practice has an ambiguous meaning attached to it. It does not always refer to the taking of formal practice lessons; it may also refer to a little experimenting, having fun with singing at any time. This means you can sing while cooking, while driving to work or at any other favorable time; however, you are cautioned against overdoing it. 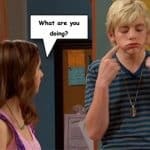 If you overdo it, you may end up straining your voice which is something that you do not want. The use of a mirror is also encouraged in learning how to sing. Standing before a mirror while practicing will assist you to make the necessary adjustments needed such as your poise, which improves your singing. Drink water: Just like any other machine, your vocal cords need lubrication. Drinking enough water during singing practice to keeps your vocal cords wet and well lubricated. This prevents your voice from becoming croaky.